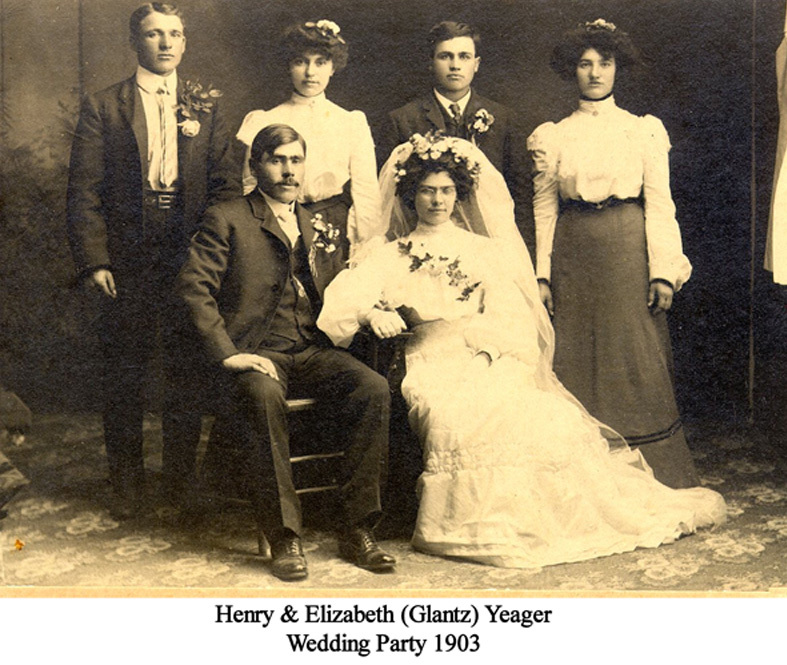 Elizabeth Glantz married Henry Yeager in 1903. She is the daughter of Conrad and Amelia Glantz. Both were from Norka, Russia and immigrated to the United States in 1900 through a port in Texas. Henry had two brothers, Martin and William, who also came to America. ​According to recent papers found [Memorial Service conducted by Rev. David L. Evans, Dec 10, 1954] on Henry Yeager, Henry was in Colorado before the 1900 immigration I found shown on the Census. The Memorial given by Rev. Evans states: "In 1897 he settled near Loveland where he was active as a stockman and farmer, and raised the first sugar beets to be processed at the Loveland Sugar Beet Factory, which was built a few years later. In 1909 he moved to a farm near Berthoud to continue in agriculture until moving to a farm northwest of Longmont in 1930, where illness forced his retirement, and where he resided until a few months before his death." Henry Yeager [b.1877, d. 1954] was the son of Heinrick Peter Jager [b. 1829] and Catharine Hausher, NeeHahn [b. 1836, d. 1894 & m. 1866]. Heinrick Peter Jager was the son of Johann Wilhelm Jager [b. 1804, d. 1882] and Anna Maria Schneider [b. 1803, d. 1877 & m. 1823]. Johann Jager was the son of Johannes Jager [b. 1784] and Anna Maria Filg [b. 1790, d. 1838, & m. 1816]. Johannes Jager was the son of Wilhelm Jager [b. 1761] and married to Anna Margaretha Frick [b. 1764, d. 1839]. Wilhelm Jager was the son of Fredrick Jager and Anna Elizabeth as shown on the Pleve chart. Harold Yeager b. 1908 d. 2000 married Glendora Baller. They had two daughters and a son. Albert Yeager b. 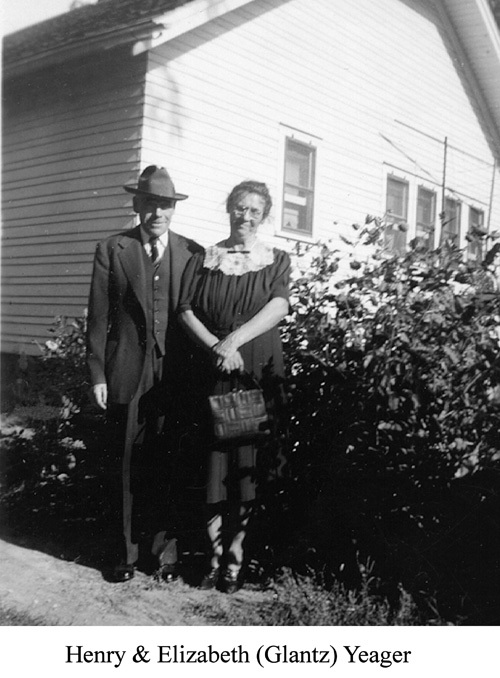 1912 d. 2001 married Merl Bragg. They had a daughter and a son. Alma Yeager b. 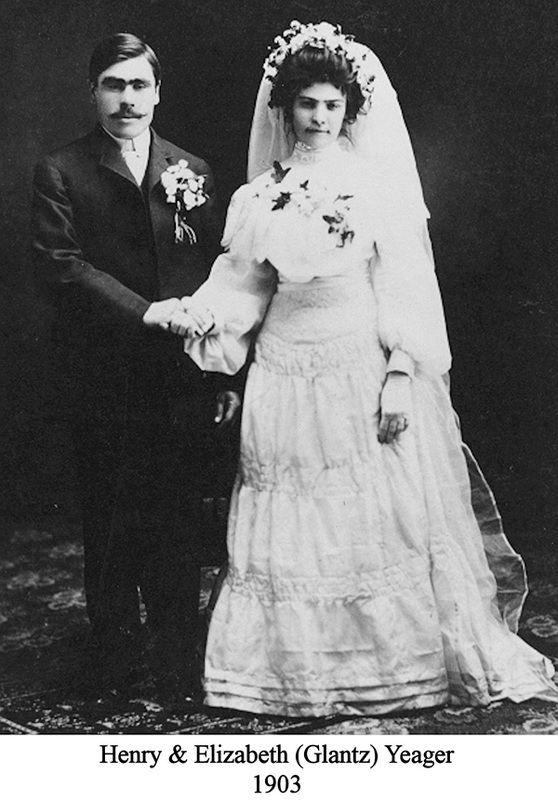 1916 Married Richard West. They had two sons. Victor Yeager b. 1919 d. 1994 married Nancy Loker. They had two daughters and two sons. Edna Yeager b. 1923 d. 2000 married Kenneth Thomas. They had three sons. 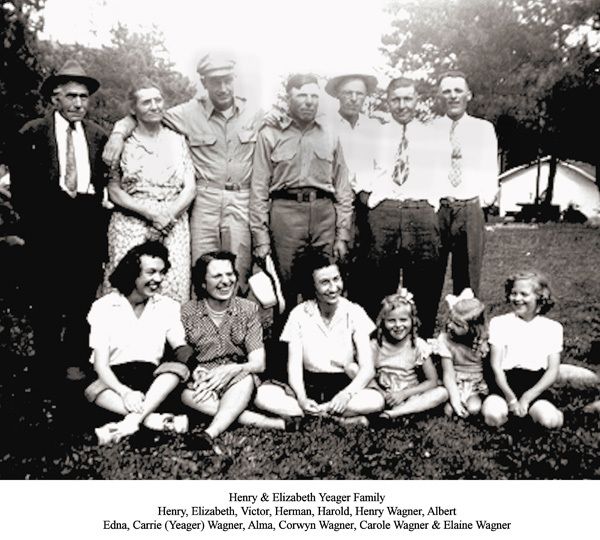 I am the grand daughter of Elizabeth Glantz and Henry Yeager and have been working on the family genealogy for a good number of years. A few years ago I began working with six of Dan Glantz's daughters who had also been working on genealogy and our project grew. I began this journey and my goal was to have everyone's data. However my journey grew in to a longing for more than names and dates. As I began getting acquainted with those who came before me, met new family members or became reacquainted with others my longing turned my heart to much more. I discovered roots which ran deep and built the foundation of a family. A family blessed by our ancestors who gifted us so much by coming to the United States. 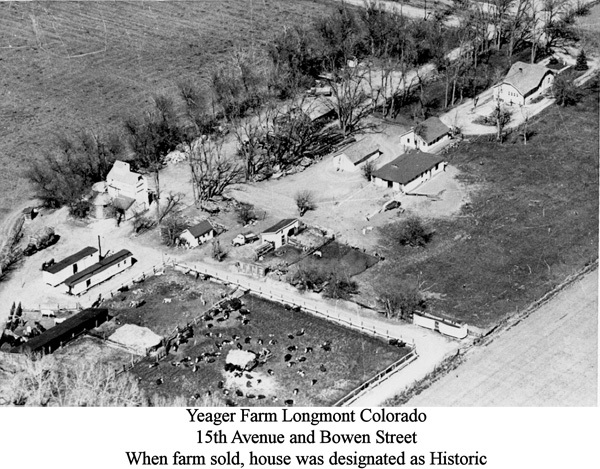 ​The Yeager Family have been longtime residents of Longmont Colorado. Henry farmed in the Loveland and Berthoud Colorado area before moving to Longmont. Three of his sons, Herman, Harold and Albert, continued in his farming footsteps, while Victor attended college and worked in pharmaceuticals. It was important to Henry and Elizabeth that their daughters be educated and they made sure, with the help of their sons, that their daughters were educated women. Carrie attended Colorado Teachers College in Greeley and became a country school teacher, Alma became a beautician and Edna attended CU in music. The brothers owned three farms. One of which was, after many years of farming, developed by Herman and Albert into housing and the very first shopping center in Longmont called Yeager Garden Acres, sold, now called Main Street Market Place at 17th and Main. The other two farms were sold for housing when it was no longer feasible for the families to farm. The last 34 acres on the Home Place where Henry and Elizabeth lived, were sold in 2004 for development Their house was designated as 'Historical' by the City. A note about Henry from one of his grand daughters was sent to Jan stating, "I remember our Grandfather Yeager. I remember a moral and a wise man who lived his life in terms of right and wrong according to his great reverence for God. I remember a man of great stature and talent and vision who studied scripture, who tended his bees, who crafted farm and household tools on his forge, and who grafted his prize fruit trees in the orchards he loved. I remember a noble man who carried his burden of declining health with dignity. I remember a grand presence as he sat on the porch swing and welcomed visits from his granddaughters." Contributed by Janet "Jan" (Yeager) Boespflug - May 2010. Last updated March 16, 2016.